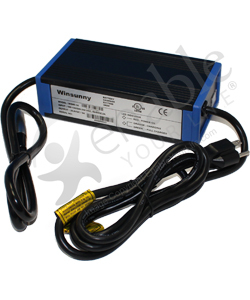 The Winsunny 3 Amp Wheelchair / Scooter Battery Charger with XLR Connector features a small design with switchable input voltage making it perfect for travel and worldwide use. This off-board portable battery charger is not the same as the on-board battery charger that is mounted to some Invacare power wheelchairs. While they look similar, the on-board models use modular plugs designed to connect into the power wheelchair wiring loom and control board and this one does not. The XLR pin connector is standard on many electric wheelchairs and scooters from Invacare, Quickie, Pride, Merits, Pacesaver, plus many more. You can see a picture of the XLR connector above to verify that your wheelchair or scooter has this. Your wheelchair or scooter must use a 24V system (two batteries) and the batteries must be wet lead acid or gel cell lead acid 28 to 60 Amp Hour. Recommended for Group U1 batteries (Group 22 batteries can be charged but will take longer to get a full charge). Overall length is 7 1/2"
Overall width is 3 7/8"
Overall height is 2 1 1/8"